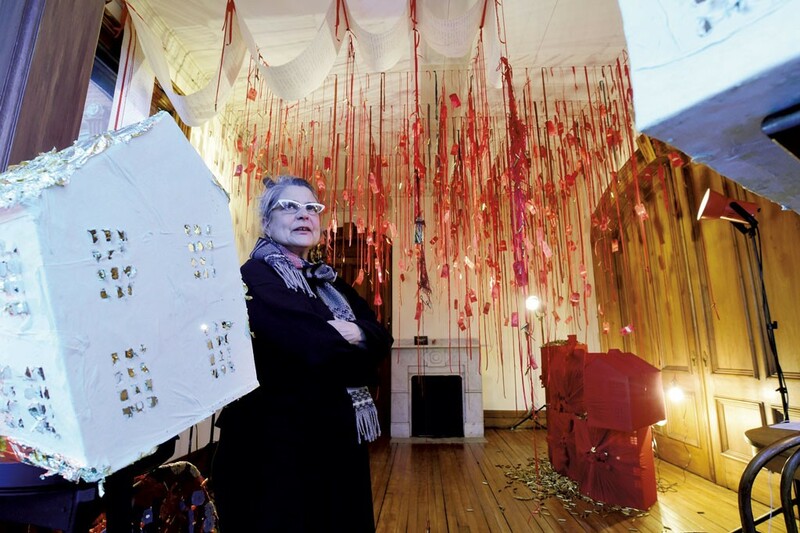 A single gunshot sounds amid the forest of red ribbons and shiny brass bullet shells hanging from the ceiling of Montpelier's newly opened Susan Calza Gallery. "That's Yo-Yo Ma and gunshots," Calza explained calmly. The disconcerting combination of tracks — Yo-Yo Ma's "Six Evolutions — Bach: Cello Suites" and a gunshot recording — scores the artist's solo installation and inaugural gallery show, "Domestic Disasters." Calza is a multimedia artist who moved to Vermont in 1992 to take a position at Johnson State College, now Northern Vermont University-Johnson. There she cocreated the Johnson State College/Vermont Studio Center MFA Program and remained a faculty member until 2014. 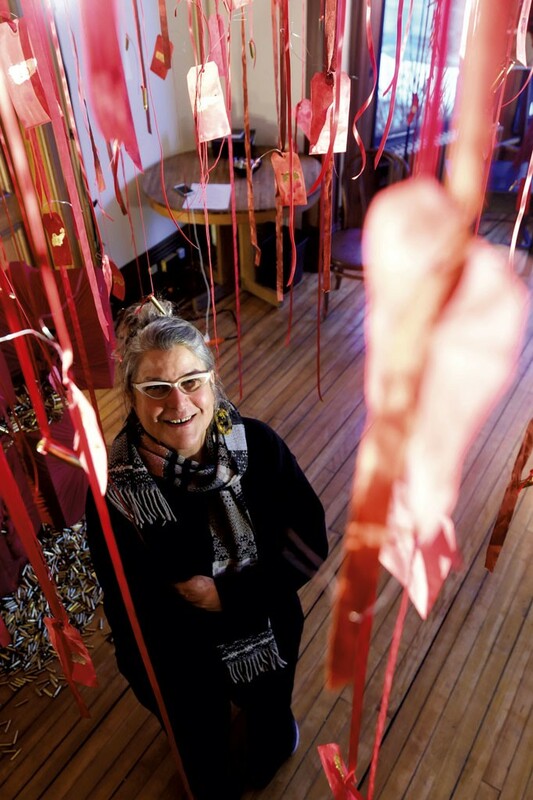 "I've wanted to open a gallery for a long time," Calza said, and domestic "disasters" of all stripes seem to have pushed her toward finally achieving that goal. Calza lives just a stone's throw from the historic 1876 Brock House on Main Street; she first noticed its high-ceilinged street-side room for rent while walking by last fall. Her mother had recently passed, leaving her about $10,000. On October 5, Calza decided to commit most of that inheritance to leasing the room for a year. That was after she learned that Sen. Susan Collins (R- Maine) would vote to confirm Brett Kavanaugh as a U.S. Supreme Court justice. The world is just wrong, she remembered thinking. Renting the gallery, Calza said, was "better than a new kitchen. In my life, what do I need a new kitchen for? I wanted to have a venue, have a voice." Calza opened her doors in time for Montpelier Alive's December Art Walk and currently welcomes visitors by chance or appointment. A grand opening is scheduled for Sunday, January 13, with regular gallery hours Fridays through Sundays after that. "Domestic Disasters" focuses on gun violence, a topic Calza began exploring during her May 2018 residency at the Massachusetts Museum of Contemporary Art. "I started ['Domestic Disasters'] when there had been 316 mass shootings in the U.S. in 2018," Calza said. That number comes from Gun Violence Archive, which defines a mass shooting as one in which four or more people, not including the shooter, are injured or killed. The organization's final toll for mass shootings rose to 340 by the end of 2018. 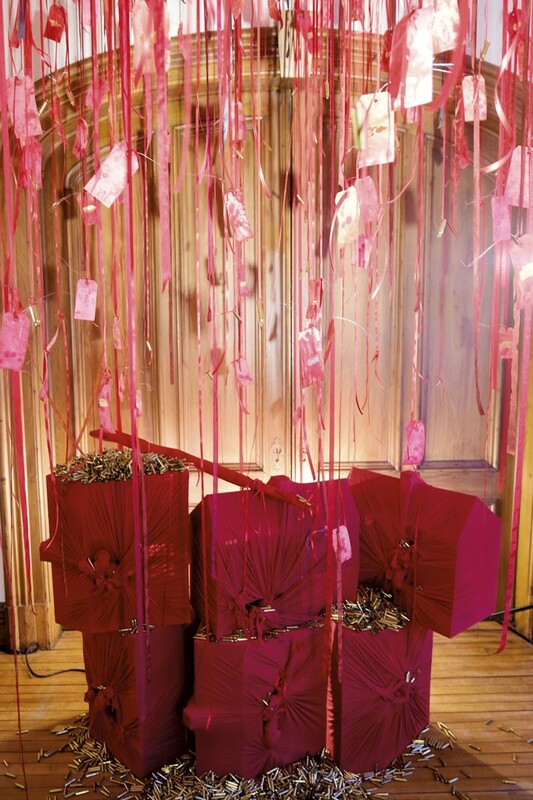 Calza represents each of those shootings with a small tag painted red and embossed with a number in gold. Each of them dangles from the ceiling on a festive red ribbon, surrounded by gleaming AR-15 bullet casings. The tags, which resemble both price tags and gift tags, are for sale at $10 each. Calza said she'll donate half of the proceeds to organizations working to prevent gun violence. Also hanging from the gallery ceiling is a billowing scroll with the date of each shooting, its location, and the number of people injured and killed written in brilliant red ink. Near the window, the list continues into 2019. "I have three more to add," Calza said. Overall, the effect is unsettling; as in Childish Gambino's controversial music video "This Is America," a tone of merriment gives way to horror. Other elements of the installation are perhaps more ambiguous, showcasing Calza's ability to teeter fruitfully between whimsical and weird. On one side of the gallery stands a jumble of six vintage metal dollhouses, each wrapped in knotted red fabric; a similarly shrouded rifle perches among them. The gallery's picture windows hold two dollhouses on pedestals, lit from above and behind with red light bulbs. One appears to be molting its skin of gold flake; five of its rooms are marked "brilliant" in pencil, and the sixth is marked "lost." In that sixth room, a single dollhouse chair faces a corner. Calza said that's a reference to, among other things, the literal isolation of Sandy Hook Elementary School shooter Adam Lanza and the mental isolation of gold medalist Michael Phelps, who has been public about his struggle with depression. Atop the second dollhouse is a fetish-like figure that resembles an oversize wishbone wrapped in gauze and given a blond wig. Calza, who said she always wished to be blond, identified it as a self-portrait. Near the windows, two of her dreamlike drawings hang above a rocking chair draped with a salvaged handmade coverlet — "I love rescuing old things that women have made," Calza said. 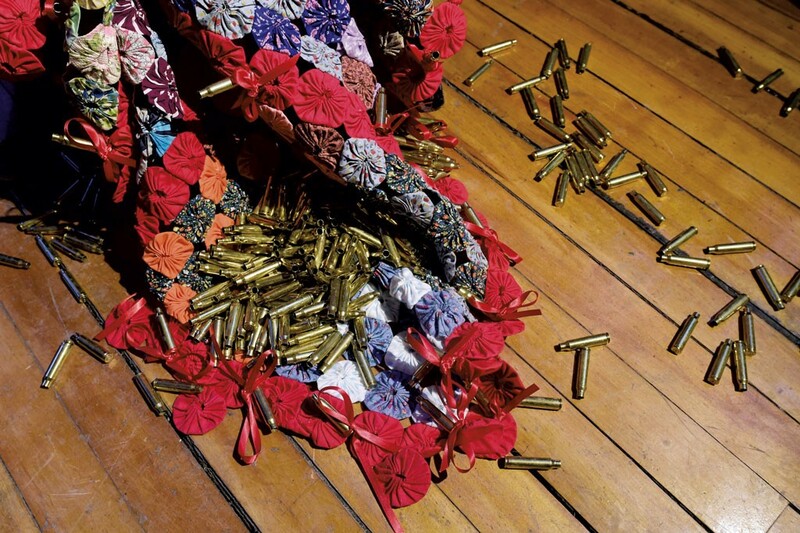 The blanket is sprinkled with bullet casings. After "Domestic Disasters," which will remain on view through February 10, Calza plans to mount an installation with the loose theme of immigration. After that, she said, we'll have to wait and see. The artist also intends to launch a monthly Sunday salon series featuring poetry readings and presentations by local artists, activists and scholars. In the works, too, is a "really dense showcase" featuring multiple artists and a theme of vulnerability, which she'll host at her much larger studio space in Barre. Of her overall artistic and curatorial philosophy, Calza offered, "This is a terrible generalization, but I always feel the best work is [from] cultures that are really stressed." For the U.S., she said, "The time's right now; it's rich and juicy and dark — let's look at it." The original print version of this article was headlined "Gun With Occasional Music"